The Smart Apartment is not all electronics. Some smart ideas are mechanical. The dual flush toilet cistern is one of these. You can save a considerable amount of water to help the environment (and perhaps save some money) with a properly installed unit. These units have two buttons: one for a full flush and one for half, as required by the user. But these units require maintenance to work correctly. There is a very useful web site of Caroma Video Tutorials, showing maintenance for a Caroma Dual Flush Toilet, including how to adjust the water level and replace the flush valve. They also have videos explaining the differences between the Australian technology in the Caroma and standard North American toilets. 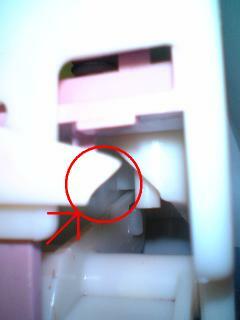 Part of the dual flush mechanism had broken off my flush valve (see image and enlarged view). As a result when I pushed either button I got only a half flush. 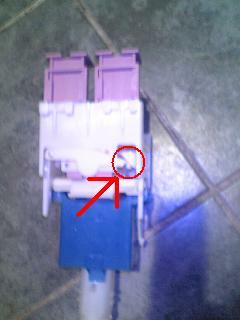 Rather than replace it, I found I could heat the end of the broken plastic part with a match and then bend it to reach the button. Copyright © Tom Worthington 7 February 2006.